05-Nov-2005 -- Continued from 12N 13E. Our original plan was to leave this morning for Sukur, however two nights before we had been at the Lake Chad Club where we got introduced to Gisela who has been living in the northern part of Nigeria for many years and travelled this area extensively. From her we got the information that it was useless to visit Sukur when having only one day to spare at this destination. We would need at least three days to explore this area. So we changed our plan and stayed a further day in Maiduguri. We were very glad we did so, since all the people we met in Maiduguri were very pleasant and we felt very welcome in this city and also had the time to visit the confluence 12N 14E, which proved to be a very interesting one. Early in the morning we left Maiduguri and went to Dikwa. 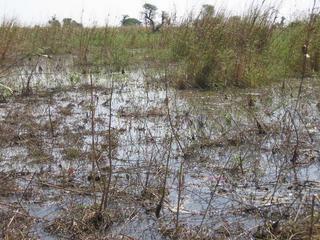 25 km before Dikwa we saw on both sides of the street large areas covered with reeds and swampy patches. We wondered if we would ever get to the Confluence in this terrain. At Dikwa I inquired about a village called Adschiri which is in the direction of the Confluence. In no time we found someone who was willing to show us the way through the town onto the path to Adschiri. His sense of a drivable road did vastly differ from ours. However, he pointed out the way to Adschiri to us, thereafter we went back to the main road and found a place where we could park the vehicle under some trees. We off-loaded our bikes and off we went towards Adschiri and further on in direction of the Confluence. It was a pleasant ride with a lot of people walking on this path, dressed in colourful clothes and very friendly, too. We had to follow this path; there was no turning left or right because there were either thick reeds, swamp, or fields. We were 2.1 kilometres away from the Confluence and suddenly met a river in front of us, which we would be able to cross with our bikes from our position, but unfortunately it was in the wrong direction and I did not want to cross this river again at a different location. We turned around wanted to get back to the next village to find another possible way. After a kilometre or so, I somehow thought it was a Herculean task and decided that we should go back to the river, cross it and see what is going on the other side; after all we still had plenty of time left to find the route to the Confluence. We turned around and drove back to the river and crossed it. At the other side of the river was a village. We drove around the village and managed to find a small path leading in the direction of the Confluence, but also towards the reeds and the swamp. We followed this path through the reeds with sparse fields in the middle of the reeds. We managed to get closer and closer to the Confluence and made it as close as 20 meters to it. The last 20 meters we got wet feet because we had to wade through the swamp. What a relief when we eventually got to the Confluence, made all the necessary pictures and were on dry land again. Amongst these reeds was an abundance of bird live. On our way back, we stopped at the villagers' water well and were in no time the centre of attraction. The village head rushed by and informed us just about everything what they plant in this area. It was a very lively place and it was so nice to see all the colourful clothes these people were wearing. We took a lot of pictures and left, crossed the river again and went back to the vehicle. We were very pleased with ourselves to have enjoyed this lovely ride to the Confluence. We got back to the outskirts of Maiduguri before lunch time and decided to carry on driving to the next confluence 11N 13E.